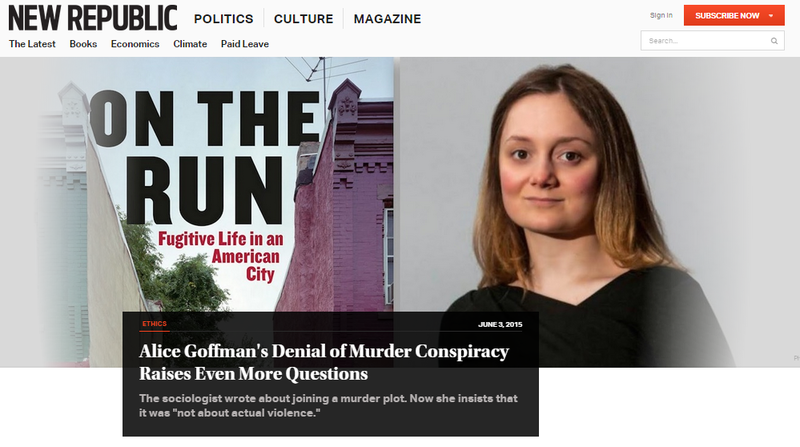 On Alice Goffman’s ‘On the Run’ and extrapolate-able truth. Screen shot of the New Republic article. 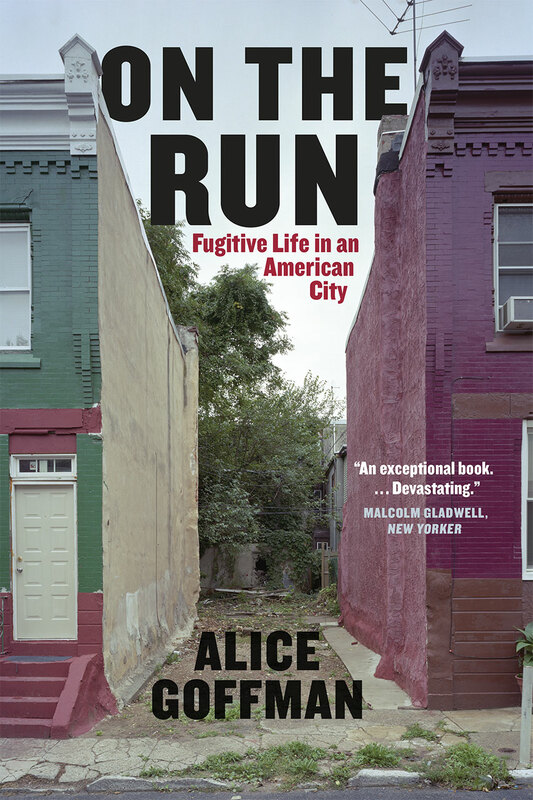 Many people have criticized Alice Goffman’s ethnography On the Run. The first set of criticisms I noticed were from people who claimed that she misrepresented black urban life by studying the particular group of people on whom she centered her book (examples here and here). Now Goffman is being accused of felony-level crimes and, by virtue of her explanations thereof, of publishing a book that is not “true.” You can read a good summary of these accusations here. Other people apparently feel that she tricked them in a different, worse way. But I’m not sure how someone could read her book and think that Goffman was implying that all black urban life resembles the lives of the small cohort of people she is studying. Goffman even included brief sections describing her time spent with very different young urban black males, a group of guys who held steady jobs, played video games, ate pizza. If she describes two very different groups that she personally spent time with, it seems strange to read her book as implying that all persons xxxx resemble one of those groups, or even that all people would fit into one of those two. Her book isn’t quantitative. Her book is decidedly not exhaustive. Her book relates anecdotes about a small set of people’s lives, and we should be embarrassed that our country is such that anyone has to live that way. And, sure, my phrasing for that last clause brings up another complaint people have levied against her book: that the young men she spent time with did not have to live the way they did. For instance, she mentions that some of them did not attend their children’s births because they were afraid of being arrested. Quite possibly it is factually untrue that these men would have been arrested out of the maternity ward. But that doesn’t matter. In a way, it’s like the premise behind Carlos Castaneda’s The Teachings of Don Juan (which, sure, I realize is an ironic work to draw attention to, because Castaneda’s work is untrue on multiple levels, most damningly that the individual whom he claimed to be studying did not exist); the book was an anthropological study of magic. Now, I believe that the type of magic described in that book does not and can not exist. But that doesn’t change my opinion that it is (or would have been, had the study not been fabricated) worthwhile to investigate the worldview of those who believe that type of magic does exist. Similarly, if the young men whom Goffman studied had deeply held beliefs about the police, and those beliefs affected their lives in profound ways, then it’s worth reporting their beliefs as fact within her book. Sure, it would have been an even better book if a footnote mentioned that she could find no evidence that their deeply held belief reflected consensus reality, but within a study like hers the most important thing to do is understand the constraints and beliefs that guide her studied cohort’s actions… and no one has presented any evidence that she failed at that objective. The claim that Goffman is a criminal is rather more serious. I don’t think it’s any more reasonable, however. A major point of Goffman’s book is that many behaviors qualify as “criminal” within the world she was studying. Young black men can be arrested for standing outside looking “suspicious.” They can be arrested for failing to pay fines or court fees. And, because there is a long history of unethical police behavior, they cannot rely upon the police to protect their property, or their lives, or their loved ones. So I think that even if Goffman had done some things that violated the letter of the law (including “loitering,” or touching marijuana, or driving above the speed limit, or transporting a very angry dude with a gun), she would have been justified. She has stated that the actions she took were not illegal, though — that there are additional facts that weren’t reported in her book. And that statement has resulted in the accusation that she created a fiction through omission. Lying by omission is a huge problem in academia. There have been big stories in the news lately about false studies wherein the data is totally fabricated. But the bigger problem, and source of many more untrue findings, is data that is real but reported selectively — if you collect data on thirty or more variables, and then report a finding based on correlation between two of those variables, your result is probably not real. This practice is extremely common. I’ve been involved with this. Nearly all my friends who’ve done academic research have, too. It’s bad. We shouldn’t have. If Goffman had collected data that showed that most young black men are never harassed by the police, and then she published a book claiming that most were, that would be roughly equivalent. That’s not the book she published, though. She lied by omission in that she did not include every single detail she knew. Which is fine, obviously. If completeness is necessary for a work of nonfiction to be true, then only mathematics texts deserve the classification. By the time you toss in enough approximations to study physics, or, worse, chemistry, or, worse, biology, or, worse, psychology, or, worse, sociology, you’ve layered in so many truth-eliding approximations that whatever you write will not be correct. Goffman’s work is no worse in that sense than any other work of cultural anthropology or ethnography that I’ve seen. And the negative reviews of her work that I’ve read seem to be about her work specifically, not complaints about her field. And, sure, perhaps it is valuable to complain about the field. Researchers introduce biases. Only finite amounts of data can be presented in any summary. And it’s human nature to extrapolate broad conclusions from limited amounts of data; it takes conscious effort to remember that anecdotal studies are relevant only to extremely small groups that closely resemble the studied subjects. But Goffman’s book is still valuable. People like the men described in her book exist. And, even if the only such people are the small number whom Goffman spent time with (not that this seems to be the case), we should still feel ashamed — as per John Rawls’ A Theory of Justice, a society in which anyone lives that way, no matter how few such people there might be, is unjust. On Boyhood (the film), specifically the eleven seconds between 2:34:11 and 2:34:22.